There is no potable water on site, and the restroom facilities will be built by participants. There is no power, generators are recommended. If you do not have one in your squad, you may give your spare batteries to the supply officer and he will charge them for you. Red Tactical Airsoft and SC Airsoft Supply will be vending, cash is recommended. MREs will be for sale @ $8 apiece, but the meal ticket is a lot less. 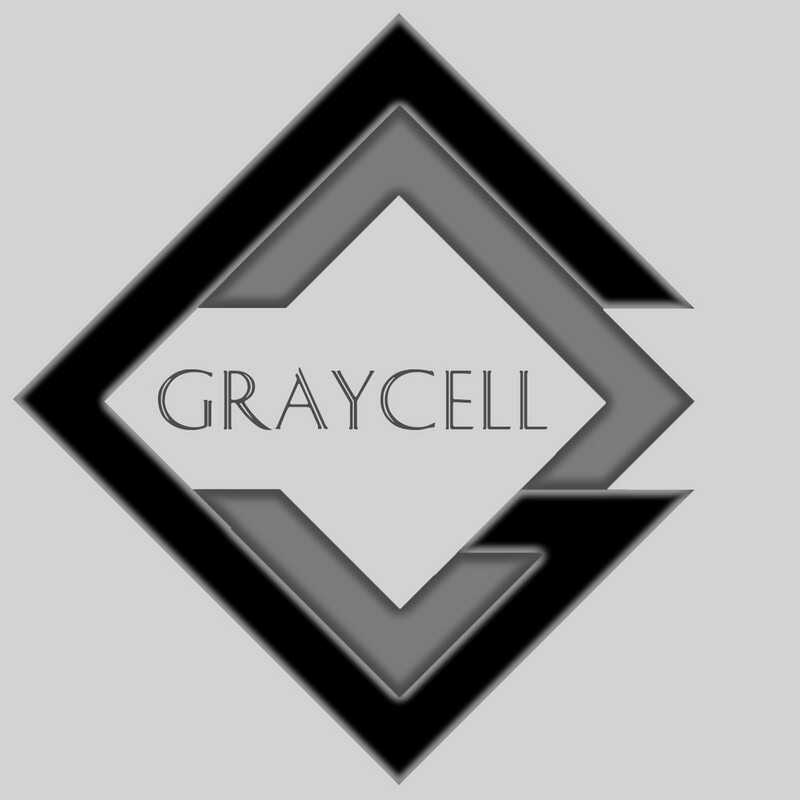 The Graycell series follows the exploits of an American based (fictional) private military contracting firm known as "Graycell". This event follows a ‘deployment’ of the company in the mountains of Tajikistan, a small landlocked ex-Soviet nation in central Asia. Last Year: A well funded and organized militia, believed to be backed by the "Islamic State" movement, has begun attacks against Tajikistani assets and personnel in the mountains near the border with Afghanistan. They have been burning cotton fields and are now actively preventing the mining of aluminum in an attempt to deprive the government of the revenue it needs to stay afloat. Though Takijistan requested assistance from the UN security council, they were denied. They fear using their own military as many of its personnel may be sympathetic to the cause of the insurgents. Tajikistani officials are also afraid that if civilians are caught in the crossfire, it will be blamed by the radicals and the incident will be used to further rebellious aims. Therefore, they have hired Graycell and will deploy them to combat the threat to their mining industry near one of the largest aluminum mines in the country. It has already come under attack, and locals claim that insurgents are operating freely in the vicinity. Graycell is under contract to arrive no later than October 21st, 2016, and to immediately begin combat operations against insurgent elements in the region, as directed by the Tajikistani President. The insurgents are expected to prepare accordingly, as intelligence of Graycell involvement is assumed to be compromised. Present Day: After an intense, high-casualty operation last year, Graycell has maintained a tentative security presence at strategic positions throughout Tajikistan. Once it had been discovered that the reportedly ISIS backed insurgents were actually part of an experienced mercenary cartel totally unaffiliated with ISIS, the artificial unity of the insurgents began to fall apart. It's still very unclear as to why this group, known as the "Black Dogs", was operating in Tajikistan and undermining its government. Little is known about them, but they have a track record of causing problems in many central Asian nations and surrounding areas, including some little known activity in Iran. While the history and motivation of the Black Dogs is still unclear, what is known is that intelligence assets have indicated a new initiative by them in the region around Karakul Lake. They have been gathering personnel and war materiel in the nearby mountains, and IEDs have been found along M41. These have been comprised of high explosives and shaped charges, possibly obtained from Russian sources and being deployed with some sort of "expert" help. These IEDs have been used to specifically target government vehicles. The government of Tajikistan has contracted a unit from Graycell to move to the area and set up a defense of geological assets (aluminum mines) and to actively patrol major roadways, especially M41. In order to facilitate combat operations, a FOB will be set up near the abandoned town of Karakul, just off of M41 itself. This is not your run-of-the-mill paintsoft style 'MilSim' Scenario, this is a RealMil. Make sure you read thoroughly, noncompliance means you don't take the field. Acceptable pants/shirts/jackets/fatigues: Anything that is solid (not a pattern) black, tan, or brown. Acceptable Headgear: Anything that is solid (not a pattern) black, tan, or brown. Acceptable load bearing gear: No restrictions. Staff Officer: Spends most of their time at the TOC (Tactical Operations Center), and some of their time getting in on some action. Staff positions include; CO/Admin, XO/Admin, S2 (Intel), S3 (Operations), S4 (Logistics), S6 (Comms), Adjutant (Max. 2). A significant field fee reduction is provided due to spending half of the time not actively engaged in a combat role. Squad Leader: The leader of a cohesive unit of 8-12 for the entire duration of the game. Answers directly to command staff, responsible for everyone under his command and the execution of all orders from command staff. Must be competent and wholly devoted to the oversight of the men under his command and the direction of his superiors. RTO: An important asset to his squad, he is responsible for relaying information via radio between his Squad Leader and command when out in the field. Must be able to speak clearly and follow basic comms etiquette. Medic: Usually two per squad, depending on numbers. They will be responsible for carrying and applying bandages and IV sacks to wounded players. Bandages and IV sacks will be supplied by command staff and will be limited. Support Gunner: One per squad max, carries a support weapon. Riflemen: Seven per squad max, carries an assault rifle or DMR. Sniper/Spotter: Must have a legitimate (100' MED w/accuracy mods) DMR or SWS and be competent in field craft. Each faction will have no more than 2 sniper/spotter teams of 2 persons each, they will report directly to command. There will no longer be special extended operations squads. All squads on both factions are expected to be prepared for extended patrols and bivouacking. To that end, see the recommended items below. -It is your responsibility to understand and comply with all rules and regulations at all times. -Many people have a habit of removing their blouses in game, this is fine so long as your under shirt matches your faction color scheme. E.G. : If you are on the GC faction and want to remove your long sleeve blouse of the appropriate camo type (listed above), but your undershirt is black, you WILL NOT be permitted to do so as it would cause IFF problems. Plan accordingly and come prepared. -In game missions will be given to your squad leader, he will be briefed by command staff at the TOC (Tactical Operations Center) prior to going out on mission. Your squad leader will then brief you and conduct a PCI (Pre-Combat Inspection) before you step off. If you have any issues or questions at any time, report it up the chain of command. -Specialized roles like Medics cannot be swapped between players anywhere except the FOB. -In addition to the obvious admins in the field (wearing dead rags and out of play) there will be embedded admins playing alongside and against you. Your CO and XO will also be admins. If you have an issue in the field, call it up the chain of command to your CO/Admin, or if an out of play admin is near, ask them to address the issue. Violation of any rules and/or refusing to comply with the direction of an admin are both grounds for immediate dismissal from the event without a refund. -Upon being shot, players may either call for a friendly medic if there are any live ones available in the area, or wait AT LEAST 7 minutes until they have bled out, at which point they must head back to their TOC (after having bled out players are 'walking dead' and may not interfere with the game world) and report to command staff as KIA, they must wait to link up with their unit until directed by command staff. DO NOT just walk back onto the field by yourself after having bled out and making it back to the FOB. Players are required to time their bleed outs accurately. Any player wearing real body armor (this can include real ballistic helmets, kevlar jackets, plates, etc.) has the option of receiving a third medic heal. This heal would be administered just like a second heal (a friendly Medic (not just any player) has a bandage (provided) and is able to apply one to you before your 7 minute bleed out has elapsed, AND has an IV sack (provided) that they give you, then you are back in the game once it has been "drained".) This third bandage may be applied to either ankle/shin. The 7 minute bleed out time is mandatory no matter where you are when hit, unless you are 'healed' prior to the time having elapsed. Hit players may not talk except to yell for a medic, and may not use a radio in any way, even to call for a medic. Hit players may not move unless "dragged" by a live player. If a live friendly "drags" you, the two of you can limp; if two live friendlies drag you, all three of you may walk quickly. -The "New Life Rule" is in effect. Think of yourself as a role player, if you are KIA then you do not remember anything that happened before you died. This means that all intelligence relative to the game world is lost when you bleed out. -All players may carry unlimited midcaps/lowcaps, and NO Hicaps of any kind EXCEPT for support weapons, there are no restrictions on mags for support weapons. There are no limits on M203 shells, claymores, grenades, or pistol mags. You will be checked during PCIs. -Though you may bring extra BBs with you in the field, players may NOT reload ANY magazines/grenades/etc. UNLESS they are either; at their TOC/FOB; or are sent a "resupply drop" by command. If you run low on loaded mags and you are out on mission, ask your squad leader to approve a request to command for a resupply drop. -NO private (noncombatant) vehicles in the play area during game on will be allowed. The entire field, except the FOBs will be considered IN PLAY. Leave your car in the parking lot, but make sure that EVERYTHING you will need during the event is at your FOB before game on. Once the game starts you will not have access to the outside world, including your car. Your supply officer will bring you water and recharge your batteries for you offsite. 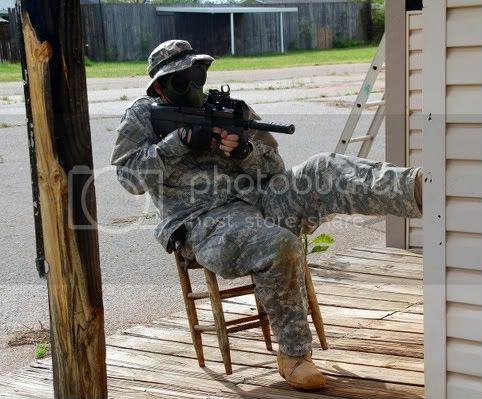 -Thunder Bs, TAGINN, Tornado grenades, and similar airsoft grenades are allowed. If one of these detonates inside a mostly enclosed building/structure/trench section/etc., everyone inside is dead (in multi-roomed buildings, it affects only the room or hallway in which it detonates, use common sense). If thrown outside of a structure, a BB must make contact with a player to kill them. Any other device such as claymores, mines, M203s, etc. must fire a BB to cause a "kill". Hits from any of these devices are hits, no matter who placed them or got hit by them (because friendly fire always counts). If you step on a mine and it detonates, you are hit. -Camping is allowed Thursday night, and during the game. There are designated camps for each faction, you will be required to drop your gear at your designated camp (FOB), and then move your car to the parking area and leave it there. Each squad in each faction will have a designated section of the FOB, and while the FOB area will be 'cold', it is still considered an in game area and part of the AO. The TOC will be at the FOB and will be staffed by command 24/7. There will be one campfire per FOB, so that it can be continually monitored. Any illegal activity on the premises will be prosecuted. There is plenty of firewood to be gathered on the premises. While at your camp you are still considered in the game world. -Only players 16 and up are allowed to participate unless an exception is granted. Exceptions may be granted to family members of other attendees or players that can have their maturity vouched for. If you will be less than 16 years of age at the time of this game and wish to participate, please contact me. -If you are expressly ordered by command staff to take prisoners, you may do so with the procedure detailed below. Do not attempt to capture other players without permission from your squad leader AND your command staff. If you are attempting to take a prisoner and the enemy player in question is alive, you may demand their surrender. If they choose to do so, continue as detailed below. If they choose not to surrender, engage them and then once they are hit continue as detailed below. Once the enemy player in question has surrendered and/or been hit, approach them and apply a single zip tie to a piece of gear on the top of their shoulder (so that it is visible). This is an indication of a search and seizure. For practical purposes, they are then considered "restrained and disarmed", but may still carry their weapons so as to protect their personal property. They may only attempt an escape or engage in combat if the zip tie on their shoulder is cut by a friendly player that is "setting them free". If the player was hit prior to applying the "restraint", they must be given "medical attention" as you would a friendly player. Once a prisoner has been taken, they are your responsibility. Report captured enemy personnel to command immediately. Command will not allow "prisoners" to be held for long periods of time so as not to deprive them of play. Prisoners ordered "released" by command staff will then be considered KIA and bled out and will proceed as such. If you are taken prisoner, try to stay in character (within reason). Do not engage in any hostile actions or escape attempts, remember that in the "game world" you are totally disarmed and restrained. Remember that if a player friendly to you manages to kill your captors and cut your "restraints", you may then proceed as normal. If you have been hit and bled out, you may not be captured. If you have been hit and have no medic heals left, obviously you may not be healed, and therefore may not be captured. Use common sense. -Armored vehicles will be in play at some point, though not at night. Do not go within 10' of any vehicle with its engine on. Do not attempt to touch a vehicle, stick a gun (or anything else) into a vehicle, throw a grenade into a vehicle, throw smoke in/adjacent to a vehicle, etc. Use common sense and stay safe. Armored vehicles are impervious to small arms fire (BBs). You may disable a vehicle by firing at it with an AT gun firing a Nerf pocket vortex or similar soft projectile and hitting any part of it directly. Launchers and projectiles must be approved by admins. Additionally, these projectiles will cause a 'hit' on anyone inside a confined structure if it goes into it or hits it's wall directly, for multi roomed structures this applies only to the room it hits. At the direction of your command staff, anti-vehicle barriers may be constructed and/or removed. The occupants of a vehicle hit by AT are considered hit, but can be pulled out and given medical attention per above medic rules. A hit vehicle must stay in place (and inactive) for 15 minutes. During this time if the crew is pulled out of the vehicle and healed, and at least two crew members 'repair' (make physical contact with the outside of the vehicle while outside of it, as if repairing) for a minimum of 10 minutes, the vehicle will be considered repaired and operational again. If this does not happen, the vehicle will return to it's respawn once the 15 minutes has elapsed, and will wait there an additional 15 minutes before it can come back into play. A vehicle that was repaired in the field and is hit again may not be repaired a second consecutive time. -Light skinned vehicles will be in play at some point, though not at night. Do not go within 10' of any vehicle with its engine on. Do not attempt to touch a vehicle, stick a gun (or anything else) into a vehicle, throw a grenade into a vehicle, throw smoke in/adjacent to a vehicle, etc. Use common sense and stay safe. Light skinned vehicles can be disabled by small arms fire (BBs). You may disable a L.S. vehicle by shooting at the driver or SIDE (not the radiator) of the engine. You may destroy a L.S. vehicle by firing at it with an AT gun firing a Nerf pocket vortex or similar soft projectile and hitting any part of it directly. Launchers and projectiles must be approved by admins. The occupants of a L.S. vehicle hit by AT are considered hit, but can be pulled out and given medical attention per above medic rules. A hit vehicle must stay in place (and inactive) for 15 minutes. During this time if the crew is pulled out of the vehicle and healed, and at least two crew members 'repair' (make physical contact with the outside of the vehicle while outside of it, as if repairing) for a minimum of 10 minutes, the vehicle will be considered repaired and operational again. L.S. vehicles hit by AT and CAN NOT be repaired, but those hit by small arms fire can. If it is not or cannot be repaired, the vehicle will return to it's respawn once the 15 minutes has elapsed, and will wait there an additional 15 minutes before it can come back into play. A vehicle that was repaired in the field and is hit again may not be repaired a second consecutive time. Rule #1: A "hit" or "kill" occurs when a BB makes contact with any part of your person excluding your weapon. This includes backpacks, pouches, camel backs, headgear, etc. Upon being hit you MUST loudly announce you are hit, and IMMEDIATELY don a "dead rag" on top of your head. A dead rag must have a minimum perimeter of 32 inches, and a bright, neon color that does not match any part of your gear. You cannot talk or communicate in any way when you have been hit. The only exception to this is to call for a medic. Giving information concerning game play or talking on radios while hit is strictly prohibited. BBs known to be "ricochets" do not count as a hit. This is any time that you are certain that a BB has hit an inanimate surface or another player prior to bouncing off of them/it and then hitting you. This being said, always remember: "When in doubt, call yourself out!". Rule #9: Your gear's predominant color must match your outfit's predominant color UNLESS you have headgear of some form and sleeves that go at least to your elbows that are the same as your outfits predominant color. If you do not meet these requirements and your gear has a different predominant color than your outfit, you will be required to strip your gear. Weapon colors and paintjobs have no bearing on faction affiliation. -EVERYTHING on the field will be SEMI-AUTO ONLY during the night portion of play EXCEPT anything that has a 0 MED (under 300 FPS w/.25gs) AND is firing glowing tracer rounds. Your squad will be given time to eat, reload, and sleep throughout the game; but your breaks will not always be long enough to cook up a four course meal while you sit around the camp fire (if you're lucky enough to have one). This is immersion, not chairsoft. When you have down time, you need to reload first, eat second, and try to catch a quick nap if you can. That's why MREs are a great option; they're fast, filling, and add just one more element of realism to your experience. If you do not want to deal with the hassle of bringing, cooking and preparing meals for yourself and your squad mates during the course of this game, limited quantities of MREs (A&B mix) will be available at the US TOC for $8 each, and a meal ticket is available during pre-registration for $55 (7 MREs). The DEADLINE to pre-register for this event is OCT 21st. If you HAVE NOT pre-registered after that date, you MAY NOT ATTEND. 1: Read, understand, and comply with this entire thread. *Refunds requested less than a week prior to the event itself will no longer be issued. If you have questions or concerns that require a detailed explanation, feel free to call or text me at 803-six zero nine-7681.